In 1914 Eastman Kodak introduced what may have been the first "databack" on a range of their cameras. They also made replacement backs available for some existing cameras, hence it is quite normal to find an apparently pre-1914 camera with an Autographic back. 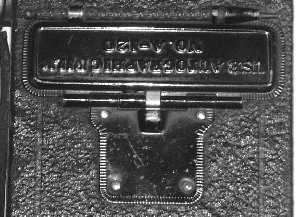 Also, as many Autographic models were basically existing cameras with a new name, some transitional models exist, sold as an Autographic, but still with the nameplate of the previous model fitted. Similarly, some older cameras may have been "unofficially" upgraded, using a new or second-hand replacement back from a later camera. The Autographic feature was provided in three styles over the years, the earliest having a sliding latch which both retained the stylus and, when released, allowed the Autographic "door" to spring open. 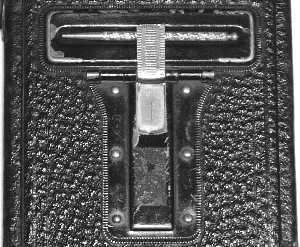 From 1916 the "door" incorporated a pair of stylus retaining rings, was held closed by a spring and detented into the fully open position. During the 1920's the "door" feature was changed completely and a sliding shutter introduced. On these cameras the stylus is kept in a pair of rings adjacent to the lens. The Autographic feature was available until the early 1930's, coincidentally around the same time as the introduction of the 616 and 620 roll-films, though the reason for the discontinuation of Autographic film was probably the increase in sensitivity of available film emulsions. Ordinary film, of the appropriate size, can be used in a camera with an Autographic back, though obviously the Autographic feature will be unavailable. In the following description, reproduced from an early (circa 1915) copy of Eastman Kodak's "How to make Good Pictures", references to a "film cartridge" mean a roll of film, in current parlance, so called because a roll of film looks like a shotgun cartridge. This same publication makes reference to Autographic Film being available in two-exposure rolls for sizes from 2�"x3�" upwards, ie 120 size and larger. The Autographic Kodak has a spring door in the back, which covers a narrow slot through which the titling is done (with a pencil or with the stylus provided for the purpose) on the red paper protecting the film. This slot is so located as to bring the title into the margin between the exposures, but if it is desired to place the title on the picture itself, a slight turn of the spool key will bring it into that position. If two lines of data are to be written, one can be placed in the margin and the other on the picture, if so desired. Such titling would appear on the bottom of an upright picture, or at the left-hand end of a horizontal picture. The Autographic Film Cartridge differs from the regular N. C. Film Cartridge in this respect. A thin red, instead of the familiar red and black (duplex) paper is used. This red paper, in itself, is not fully light-proof, but between it and the film is a thin strip of black displacing tissue. This tissue serves the double purpose of light-proofing the cartridge and of permitting the recording, by light, of writing upon the film. When the data has been written on the red paper and printed (by exposing with the door open to the sky for from two to five seconds) the image is photographically impressed on the film and appears when the film strip is developed. In making the prints the title may readily be shown upon the print itself, the letters appearing in white upon a black background in the margin, or it may be omitted from the print, remaining, however, as a permanent record for reference in the negative.